Car Seats, Boosters, and Safety Belts – Who Needs ’em? My 6-year-old daughter still rides in a car seat with a 5-point harness, which is the safest option for her thirty-six-pound frame. Lucky for me, she has not developed booster-seat envy, despite knowing that the bulk of her kindergarten buddies ride in boosters. I like to think it’s because my husband and I have instilled a safety-is-cool value in her, but maybe it’s just because she hasn’t been teased by friends for not having a big-kid seat. Whatever the reason, I’ll take it. One less battle to fight several times a day. Requirements Children through the age of seven (all the way until their eighth birthdays) must ride in a child safety seat in compliance with the United States Department of Transportation standards. Virginia bases its law on age. There are no height and weight requirements for child safety seats. Even a child who is in the top one percent for height and weight will have to ride in a child safety seat until the age of eight. From the age of eight until the child turns eighteen, a safety belt (seat belt) is still required by law. Plus, it’s a primary enforcement rule, which means that a violation can land you a ticket, even if the driver is not breaking any other law. We all know the saying. Click it, or ticket! Rear-facing Safety Seats Children under the age of two, or until they reach the height and weight limits for the seat, should ride in rear-facing child safety seats to best protect their heads, necks, and spines in the event of a crash. Virginia law requires that rear-facing child restraint devices be placed in the back seat of vehicles. If there is no back seat, the rear-facing seat may be placed in the front passenger seat only if the vehicle does not have a passenger side airbag or if it has been deactivated. Otherwise, it’s prohibited. Forward-facing Safety Seats and Boosters When a child has outgrown the weight limits of a rear-facing safety seat, a forward-facing safety seat should be used until its upper weight limit has been met. At that point, a booster seat is required by law until the child reaches the age of eight. However, children should continue to ride in the backseat and in a booster seat until they can properly fit in a safety belt, which often doesn’t occur until the child is twelve. Check with the Department of Transportation for guidelines on how to determine if your child can safely ride with a safety belt. Also, recalls happen, and you need to be informed. You should always register new car seats with the manufacturer, and you will be alerted if there is a recall. Alternately, you can visit hsrc.unc.edu. Click on safety information and then child restraint recalls. They also have a nifty feature that allows you to sign up for notifications of future recalls. • Don’t purchase a safety seat without knowing for sure that it has not been in a crash. Buying from a reliable source is key, because a seat that has been in a crash could be compromised and fail to work properly. • Look for the manufacturing date on the label and abide by its recommendations for a use-by date. If the label is missing, don’t buy it. 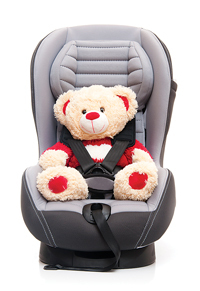 You need to be aware of recalls and expiration dates in order to safely use a safety seat. • Inspect the seat. Don’t buy one that is missing parts or has signs of damage. • If the seat is missing an instruction manual, you can find it online, or call the company directly to have one sent to you. • Finally, you can and should register your used safety seat with the manufacturing company in order to be informed of potential recalls. Recently, my daughter developed the hand strength to unbuckle herself from her car seat. A graduation, of sorts. And the beginning of a long process of healing for my rotator cuff. But moving on from car safety seats overall? After burying myself in car seat safety research for this installment of Legal Ease, I’ll probably be driving her to her high school graduation in a booster. A mother can dream, can’t she?